In this talk, Vikki illuminates her stance for an ethic of Justice Doing as a frame for community work and therapy, and consider the intersections, tensions and affinities between community work practice, therapy and social justice activism. 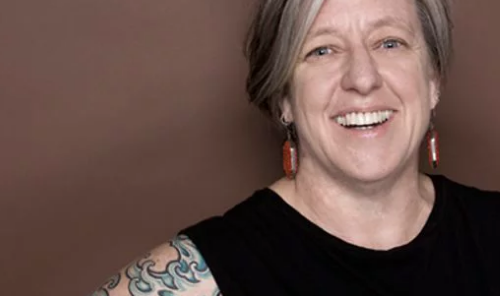 Vikki’s stance for Justice Doing in therapeutic and community work encompasses centering ethics, doing solidarity, addressing power, fostering collective sustainability, critically engaging with language, and structuring safety. Justice Doing opens our work to transformations for ourselves, the people we work alongside and our communities and society. Providing alternatives to concepts of ‘burn out’ and/or ‘vicarious trauma’, Vikki conveys how our collective Justice Doing sustains us, nourishes our hope, invites us to honour the resistance and strength we witness in the people we work alongside, and allows us to work congruently with our ethics. Vikki is a community activist, instructor and therapeutic supervisor, whose experience includes clinical supervision and therapy with refugees and survivors of torture, mental health and substance abuse counsellors, community activists, anti-violence counsellors and working alongside transgendered and queer communities. I am sitting here with my jaw somewhere on the floor. Actually it fell several times as you spoke. First it was about activism. Never thought of myself as one, I am a ‘follow the rules’ kinda person all along, as I wanted to be ‘good’. Well, I think I’m at an age where I could gladly say, am not anymore! I had grown up being told that my elders knew better. That “medicalised & sanitised” terms of suffering hides the human sufferings and injustices. I know that I’ve been getting rather annoyed when someone is immediately dismissed as PD (personality disorder) as though that explains why we can treat the person a certain way. Like it’s strange for a person to be in despair after being physically and mentally abused for the last 30 years?? I’d write more, but these are the two that I thought I’d share with you. Hearing you, have firmed up my belief in doing more of what I have been doing, to connect more deeply with the people who come to see me, to get to know their stories, their actions of fighting against injustices and norms that have caused harm to them. To continue doing those “immeasurable outcomes” because they do matter. I was so excited tripping over myself (obviously my typing is much slower than how the words/thoughts were popping into my heads!). I wanted to share that two things really struck me. One, the idea that mental health or people’s experiences have been neatly squeezed in a box by mental health diagnosis; and the other, about selfcare being a collective care. Thank you so much for this. A great presentation Vikki there is so much in what you say. So answering “How can we move from individualist understandings of ‘burnout’ and ‘self-care’ and towards considerations of solidarity and ‘collective car’? the most powerful line in Vikki’s communication was understanding sites of connection and the fluidity of imperfect allies. Being a blade of grass in the interaction and accepting the points of connection that are created in the interaction. Resisting empowering self-ideologies that cause injurious division and dignifying the innateness of the other persons experience. Providing options for the clients humanity, looking for collective ethics of the other by “leaning in” to their experience. With collective accountability we can hold onto privilege and power in our own experience while fostering sustainability in ongoing aliveness and genuine connectedness with people. Critically engaging in language that empowers innateness of the persons experiential schema and contesting of normalized language that segments, isolates, shallowly quantifies a persons being. Thanks very much for your presentation. I am very moved, despite is not at all the first time I’m in touch with your work, with these ideas of justice, solidarity and practice. But I’m not just moved, I’m inspired, I’m drawn into, I’m again thinking how much we have to do to make these ideas and theory available for practitioners for them (us) be able to translated them into practice. I think I got moved by these cos here in Latin America, specially in Chile were I live, there is a great need to justice and to me our therapeutic work (that’s my realm of work) should be informed be different ideas from the dominant ones. That’s why I work through stories and narrative practice, but I reckon it should be more discussion around this themes involving justice and their implications for work. I’m not sharing to much here this time, but found very important to say: “thanks, this work is impacting my practice, and hope my practice is impacting people’s lives… I’m trying to try my best”. Hey Vikki – I enjoyed watching your presentation very much. You frame the issues around doing social justice work brilliantly I think. I liked your analysis of how certain words / notions (e.g. ‘burnout’, ‘suicide’, ‘trauma’) often work to individualise the issues & debate, & thus hide political / social / historical sources of injustice. As you point out, such ‘individualising’ (& subtly blaming) language practices are everyday ones, & hard to resist I think. You do a great job of drawing attention to (making visible) the ethical, social, historical, political contexts of issues like ‘suicide’ & ‘trauma’. Hey Ian, about the mixed metaphors- bring it! lovely reflection, and speaks to the important connections in our work. You have informed much of my analysis since our connection, and I have a deeper understanding of some of the histories of these ideas for knowing your important work.